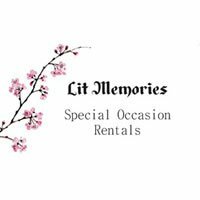 If you are looking for Rustic or Elegant wedding rentals, check out our Facebook page Lit Memories Rentals. We are here to serve the lake area with our LED trees, Whiskey Barrels and Arbors. From down the aisle, to the altar and to the reception, we can decorate it all! If you don’t see what you are looking for, please feel free to email, text, or call. We are continuously adding to our event inventory. We feel that the possibilities are endless, so tell us YOUR vision and let Lit Memories Rentals make it happen! We strive for perfection and will pay meticulous attention to even the smallest of your details.